“It’s all about the split rear window, isn’t it?” came the enquiry from a CR-Z admiring stranger in the work car park. Prompted to share more of his theory he suggested that whilst the Lamborghini Espada might have been the first and others have recently attempted to muscle in (think Citroën’s C4 coupé and Toyota’s Prius) it’s been Honda which has grasped this particular stylistic device and really made it its own. We chatted a little more about the interior and hybrid powertrain but as I drove home it got me thinking – Honda has monopolised the bisected tailgate glass to such a degree that it’s become a design hallmark of the Japanese brand. A quick sifting through the mental files confirmed the Mk II CRX, the original Accord Aerodeck (fair enough the top pane was in the roof), both Insights and the last two generations of Civic feature tailgates that are twin-glazed. Enter the CR-Z, a car which not only adds a healthy dose of flair to Honda’s line-up but pays homage to two of the aforementioned pert coupés that are held dearly in the minds of enthusiasts, albeit for very different reasons. Can the CR-Z win hearts and minds like the second generation CRX and original Insight? It looks like a CRX and Insight fusion – that’s got to be a good thing? 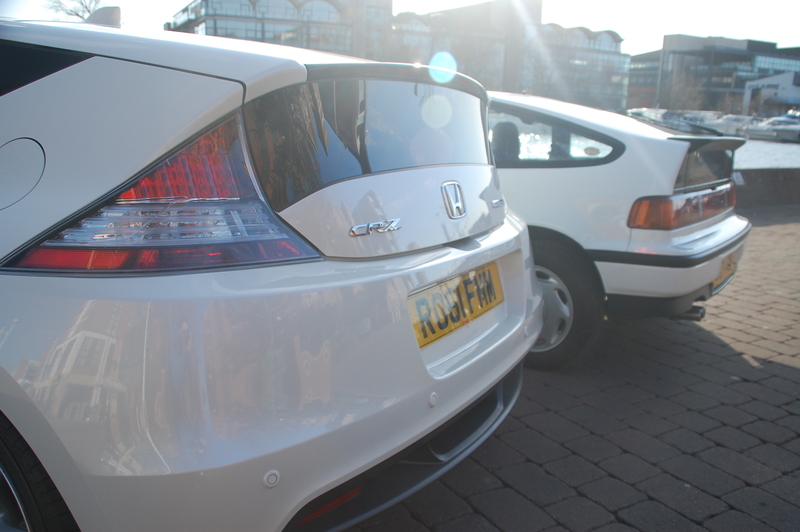 Confession time: prior to the test I wasn’t entirely sold on the Honda coupé’s looks. On photos it looked bulky and inelegant but spending time appreciating its lines in the flesh revealed a depth of quality that a 2D laptop screen just can’t convey. The overall theme is one of squat aggression, with almost all of the lines pointing forward bestowing the CR-Z with that often quoted quality of looking like it’s moving when stood still. Static wheels aside, it pulls it off too. Frontal styling is shovel-like, cleaving the air in its path forcefully and sucking what was foolish enough not to get out of its way through the gaping central grille. How refreshing to see a full depth grille on a contemporary car that manages not to look Audi-esque. Flanking the grille are two large, sharp-edged headlamp units, with a slither of now de rigeur LED day running lights along their lower edges and headlamp bezels which are tinged blue. The result is a distinct face ensuring the CR-Z isn’t mistaken for another car, even in the dark. The central ridge of the bonnet drops to lower planes for the sides, enveloping the front wheels and leading on to body sides featuring two creases, both slanted towards the nose. Between them is a modern take on the classic finger-pull door handle on the trailing edge of the doors; contemporary design that nods to the past without becoming a pastiche. Arguably there’s more visual interest in the final third of the car with dinky side window glass, sexily curvy hips over the rear wheels and swooping tail lights that meld effortlessly into that dual-level rear window. Depending on the angle of approach the rear quarters can look a touch heavy, that depth of metal and the near horizontal upper pane of tailgate glass suggesting a cavernous cargo bay on the small Honda coupé. More on that later. Bolder and curvier than the CRX, more aggressive and purposeful than the Insight but sharing their styling DNA; the CR-Z successfully melds the past in a contemporary package. 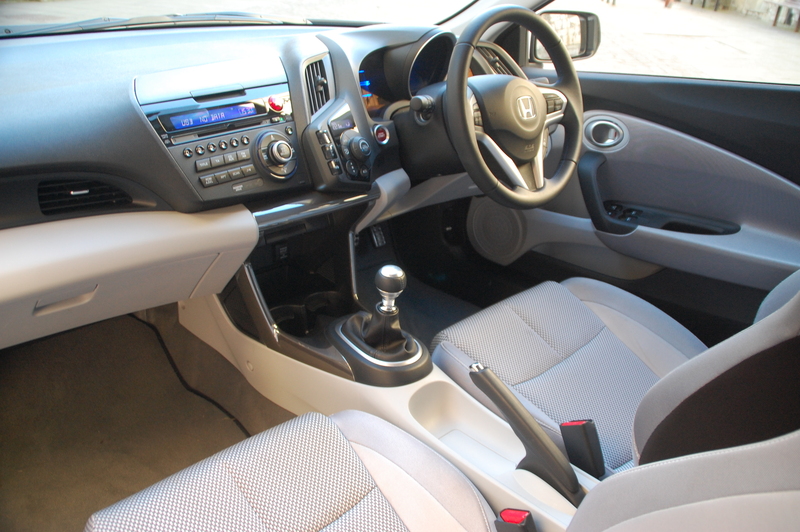 Does Honda pay homage to its past with the CR-Z’s interior? Open the wide doors on the CR-Z and you’re welcomed into a very modern, pale and airy feeling interior. Light grey plastics adorn most of the fittings, reiterating the of-the-monent feel of the exterior, whilst the front seats and door cards are upholstered in a silvery-fibred material that wouldn’t look out of place as NASA branded leisurewear. Slip in and enjoy the hugs from the front bucket seats and you’re faced with a striking dashboard. 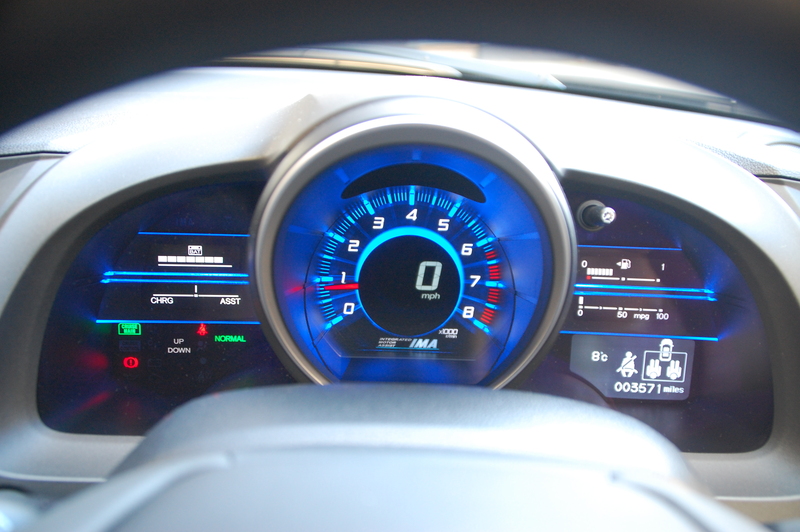 Elements of the facia resemble other recent Hondas with a mixture of digital and analogue dials, with the majority of the back lighting in a bright shade of blue. The instrument binnacle is dominated by a central rev counter with the speed projected onto a black circle in the middle of the dial. Around it the colour of the glow varies depending on the drive programme selected for the CR-Z; the Honda can be switched from Eco (green glow), through Normal (now blue) to Sport (then red) driving modes, each offering an alteration in the car’s settings such as throttle and steering responses, the stop-start mode and the level of assistance given from the electric motor. Normal by far seemed to be the most logical choice for the majority of journeys although there was an appreciable difference between it and Sport when you needed to get your foot down. Beyond that the dash looks rather haphazard although in reality the vast majority of the functions and controls fall very easily to hand and prove to be ergonomically sound, with the majority of the switchgear controls within easy reach of an exploring fingertip. What disappoints is the general feel of the materials. There’s no question over the CR-Z’s solidity and build quality, but the plastics are sorely lacking that squidgy prodability that soft-touch mouldings provide. Honda’s attempt to gussy up the cabin with bright blue back lighting, reflective trims and a mixture of matte, glossy and rubberised surfaces, smacks of trying a little too hard to overcome the tactile disappointment. It’s nevertheless distinctive. It looks a bit cramped inside the CR-Z. Is it better suited to Lilliputions? Oddment storage is surprisingly good for a small coupé, with a large central depository under the dash, door bins, a decent glovebox but no central storage cubby nor armrest above it. More than one passenger to carry and the CR-Z becomes more than a little bit cosy as the black upholstered rear seats are designed for those of a child-like stature. That said, with the driver’s seat where I needed it there was barely a hand-width of legroom for the offside-rear occupant and effectively makes it redundant if the driver’s tall. Two adults can fit on the nearside of the cabin but with the front chair hunched forwards. From the driver’s perspective, neither look comfy: the one in the front has their knees up by their chin; the one in the rear looms large in your rear view mirror, having to lean forwards in a quest for headroom. Pop up the long tailgate and you’re greeted a boot of reasonable length but not significant depth. 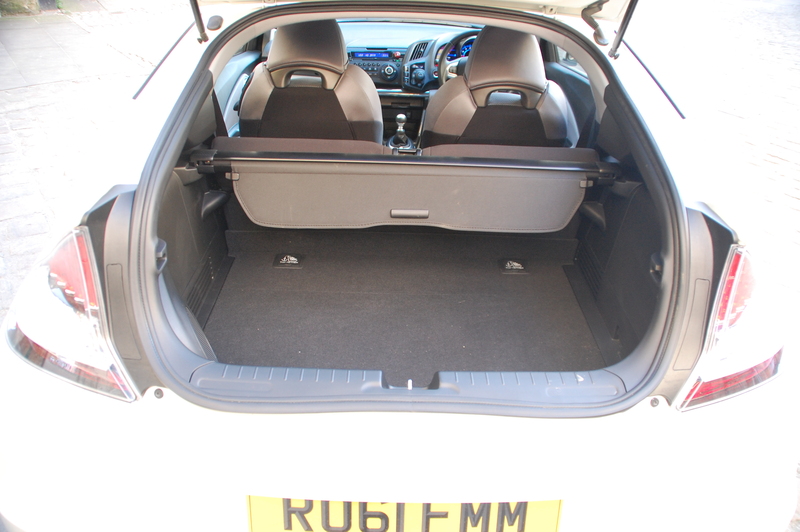 The under floor spare wheel and the battery pack for the hybrid driveline have to live somewhere, but thankfully the rear seat tumbles to almost double the carrying capacity to 389l. 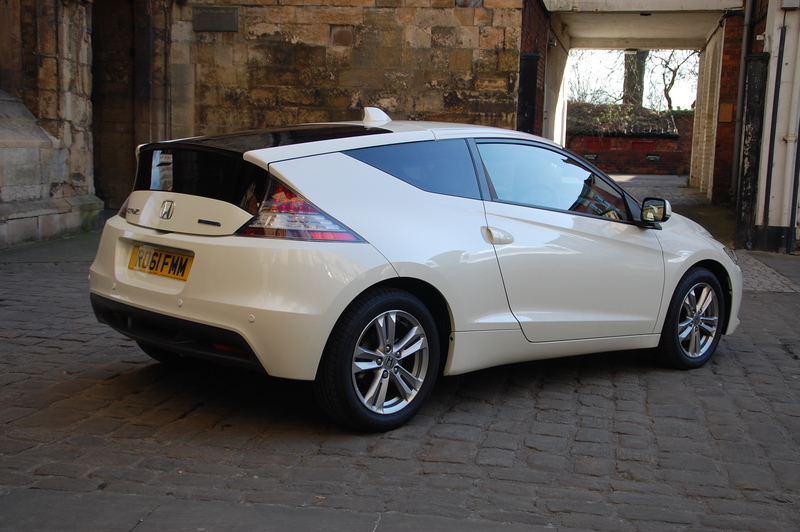 No, you don’t buy a car like the CR-Z because you want the latest packaging marvel to squeeze the maximum head and kit count into the smallest possible space, but it makes much more sense to set the Honda up as a spacious two-seater with a commodious boot than it does as a cutesy four seater. Okay, so the CR-Z is a sporty coupé – how does it handle? If you’ve sampled some of Honda’s lithe and sporty hardware in the past you’ll be relieved to know the CR-Z isn’t all show and no go, instead it’s steeped in the DNA that’s made the brand’s faster offerings so desirable. The CR-Z feels light and agile on the road, changing direction with ease and only attempting to break into understeer when cornering with excess vigour. More communication via the steering wheel wouldn’t go amiss; the tiller’s light without feeling totally anaesthetised, with noticeable weighting up as bends are powered through. Despite its light weight and short wheelbase, the CR-Z manages to avoid suffering that small car bounce in the suspension over undulating surfaces and remains composed and relatively-roll free despite possessing a ride quality that doesn’t jar your spine as you pummel over a ribbon of catseyes. The agility of the chassis reminds me of the (clichéd) kart-like nature of the CRXs of old, allowing the CR-Z to dart around quickly and corner confidently. What’s clear too is that the CR-Z could handle a significant uprating of its power output. Are you saying the Honda CR-Z is slow? No, it’s not slow but running the risk of sounding like a wannabe racing driver, more performance is always wanted. Like many engines from Honda, the 1.5-litre unit in the CR-Z loves revving and it feels like you’re making much more meaningful progress in the second half of the rev range as the four-cylinder motor sings in appreciation. Thankfully the chorus never becomes raucous. But despite the extra oomph from the electric motor, total power is just 122bhp, meaning performance feels brisk rather than fast, this Sport variant reaching 60mph in 10 seconds flat. Think warm rather than hot hatch-like performance. 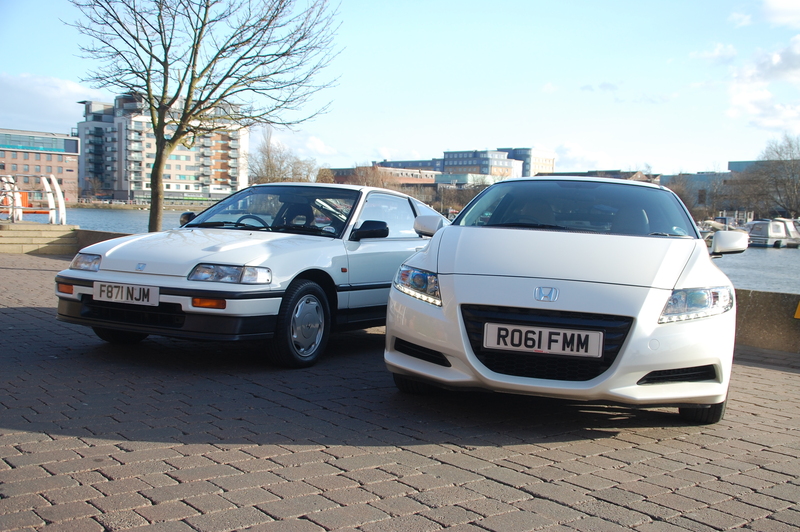 Honda’s expertise in producing high output engines is no secret and the Japanese marque has a few Mugen-fettled CR-Zs on trial around the UK. Drop the chavtastic body addenda but fit the performance and chassis modifications and CR-Z will have an appropriate level of go to match the show. 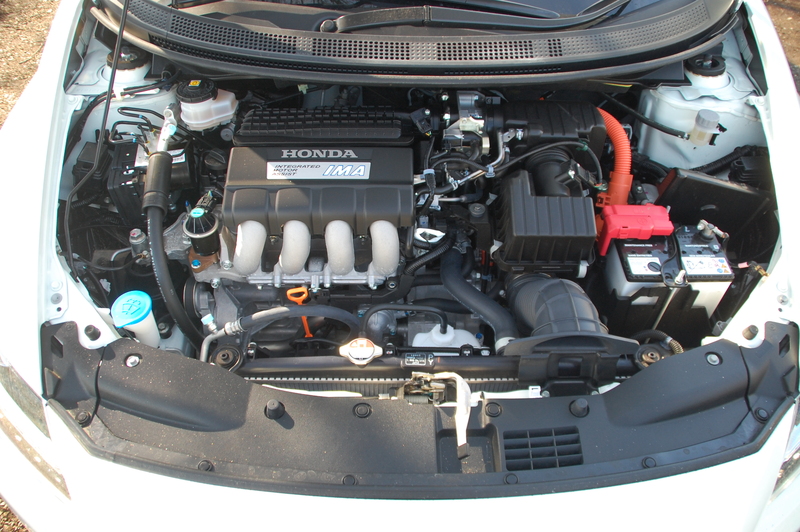 Electrical assistance and stop-start wizardry ensure that the Honda gently sips at the unleaded in its 40l tank, with an official claim on the combined cycle of 56.5mpg whilst churning out just 117g/km of CO2. 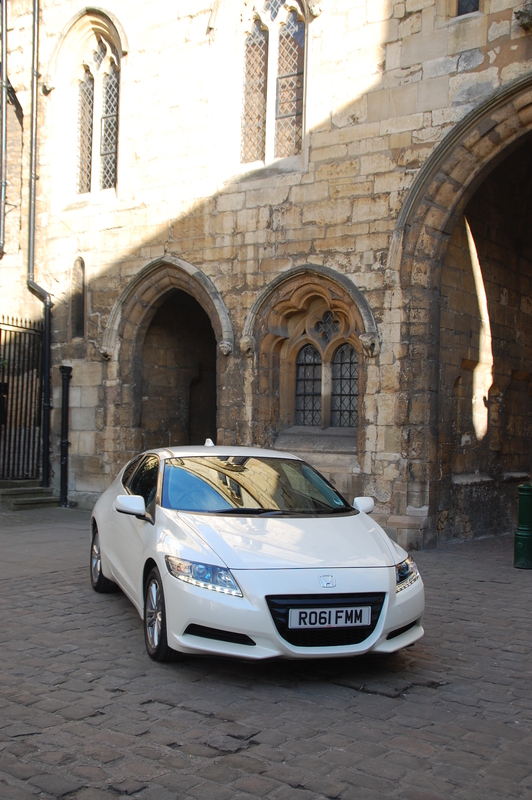 The economy figure seemed within the realms of possibility as the CR-Z’s trip computer suggesting a healthy 51mpg during a varied speed run down to the south coast and back, including negotiating the M25 in rush hour twice in a day. By my own admission, it’s taken me a while to appreciate the CR-Z’s aesthetic charms but by the end of the week in the close company of the Honda I was won over by its styling as well as the smiles per mile generated by driving the little fun box. 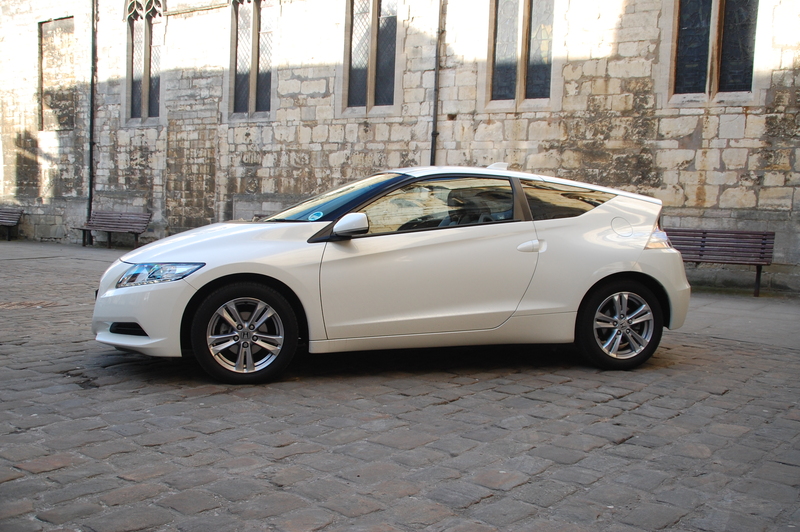 It’s not the definitive small sports coupé but the CR-Z a vital glimmer of sporting revival at Honda, a range which once included six different coupés in its line-up. But there’s more to it than a marque reviving itself. That little ‘Hybrid’ badge on the tailgate serves as a reminder of the CR-Z dual role though, for it can’t be an all-out banzai sports coupé. It has an eco message to deliver and one that is refreshingly different: no longer does buying a hybrid have to be an extension of an individual’s parsimony, nor a reflection of some kind of holier-than-thou attitude. This is a fun car that happens to be a hybrid. The CR-Z proves eco cake can be both had and eaten.